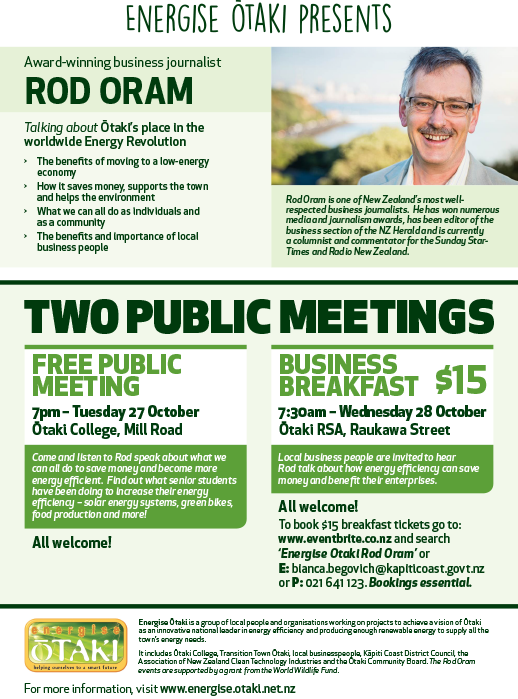 High-profile business journalist Rod Oram is coming to Ōtaki to talk about the place the town has in the worldwide energy revolution. Council is a proud supporter of the event and Energise Ōtaki, the community initiative to make the Greater Ōtaki area a net exporter of clean energy. Rod is a respected business commentator who for many years has been advocating for the kind of changes Energise Ōtaki seeks to bring about. He has won numerous media and journalism awards, has been editor of the business section of the NZ Herald and is currently a columnist and commentator for the Sunday Star-Times and Radio New Zealand. Rod will present to a free public meeting at 7pm on 27 October at Ōtaki College and then talk at a business breakfast the next day at Ōtaki RSA. He will address issues such as the benefits of moving to a low-energy economy; how doing so saves money, supports the town and helps the environment. He will also talk about what we can do as individuals, businesses and the wider community to bring about meaningful change.